1. Welsh Mountain pony, a riding pony of any color but not broken colors, up to 12 hands high. 2. 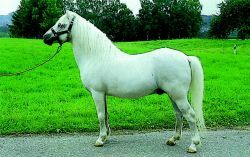 Welsh pony, similar to the Welsh Mountain pony but larger, up to 13.2 hands high. Welsh Pony was one of a pair of locos built in 1867 by George England & Co of Hatcham, London. Welsh Pony, Section B - Debbie Jones, res - Bryly Llewelyn. At Richmond she said: "I'm delighted the filly has won a Welsh Pony and Cob Bronze Medal. Welsh Pony and Cob Society spokeswoman Evelyn Jones, who met the actress as she handed over the animal, said: "She was overwhelmed and very touched. The Welsh Pony and Cob Society approached Catherine's father Dai Jones in Swansea to offer the prize pony. Welsh Pony (Cob type), Section C - Jade Phillips, res - Wyn and Ann Thomas; mare- Sharon Charlton. With this in mind the Welsh Pony and Cob Society is organising an education and welfare seminar at the Swan Hotel, Tarporley, near Beeston Market, Cheshire, on Sunday, March 29, 1pm-5pm. TWO Welsh Section A foals by the same sire, Penwisg Pip from Gill and Tom Farrow's Waitwith Bank Stud, near Ripon, dominated Welsh classes at the North Eastern Counties Welsh Pony & Cob Association Foal/Youngstock Medal Show held indoors at Richmond Equestrian Centre. The Welsh Pony and Cob Society, based in Bronaeron near Lampeter, which registers and safeguards the Welsh breeds and encourages the breeding and improvement of Welsh Ponies and Cobs, has appointed Rob Allen as its new chief executive officer and John Kirk as its chairman of council.